Well, it’s all done. 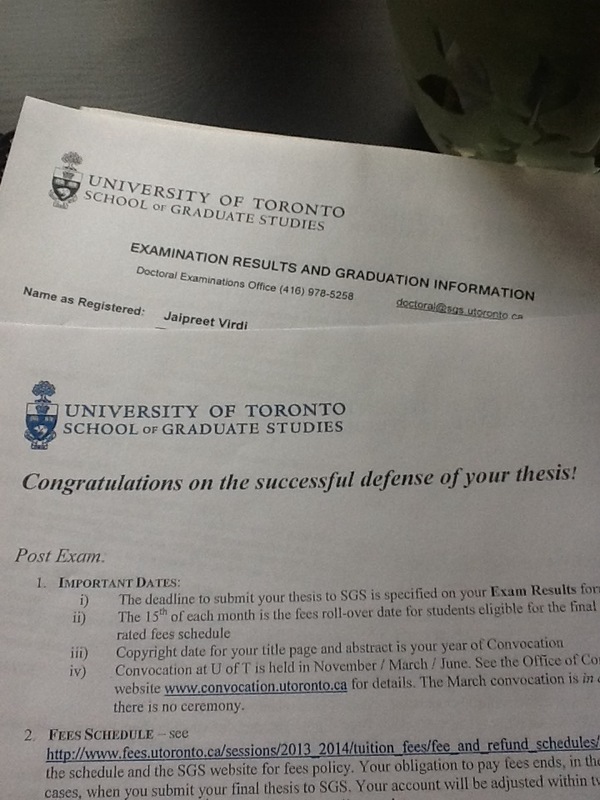 I successfully defended my dissertation on May 16, 2014, and passed with minor revisions (I’m so terrible with grammar). I owe so many thanks to all of you–for supporting me on this project, for cheering me on as I reached completion, and most importantly, for being a wonderful source of motivation. It’s because of you, Dear Reader, I write. So thank you, thank you, thank you. Below is the dedication and acknowledgements that will be placed in my final bound copy. I first encountered the story of aurists while searching through the stacks of the “Old Catalogue” of Gerstein Library for a book on nineteenth-century anatomy. The title of the book now escapes me, for where it should have been on the shelf, was John Harrison Curtis’ A Treatise on the Diseases of the Ear. I sat there on the floor, gently flipping through the pages, and finding myself lost in Curtis’ detailed descriptions of deafness. A quick Google search further piqued my curiosity as descriptions of Curtis as a “notorious aurist” seemed to contradict what I had just read. So I would like to first thank the person who removed the anatomy book; otherwise this would have been a completely different dissertation. The whole reason I was searching for the book on anatomy was to choose a new topic for my course paper for Lucia Dacome’s class on the history of medicine. Having spent five years studying philosophy before entering graduate school, I had tremendous difficulty retraining my thinking and learning how to write history. It took me a while to even understand what a historiography was. I want to thank Lucia for not only introducing me to a remarkable area of research, but for agreeing to supervise and guide me on a new path of scholarship. She patiently showed me how to address key intellectual issues I raise in this dissertation, scolded me when I fell in the traps of anachronism, and encouraged me to break out of my shyness and present my work at international conferences. The sense of marvel I initially felt in her course has created a deep and permanent love of history. I am a historian and a scholar only because of her continual encouragement and support. Janis Langins and Neita Israelite formed the other two-thirds of my supervisory committee. I am so grateful to them for their confidence and support in my project. Janis returned chapter drafts full of provoking questions, forcing me include more aspects of French medicine and strengthen my analysis. I also benefited from his corrections of French grammatical gender nouns. Neita’s energy and enthusiasm made our lively conversations over coffee all the more memorable. Not only did she clarify pivotal moments in deaf history for me, but she also outlined several avenues I could use to create a more interdisciplinary focus for my dissertation. I would also like to thank Lori Loeb and Chen-Pang Yeang, who served on my oral exam. Their insightful and thoughtful questions created a stimulating conversation and raised crucial points for me to address in future publications. Michael Brown served as my external examiner. I have long admired his work on medical culture and have the honour of being his first external Ph.D. examination. In his report, he highlighted key historiographical issues for me to address, providing invaluable comments and suggestions for reshaping my work into a monograph. I look forward to continuing our conversations down the line. Throughout this project, the Institute for the History and Philosophy of Science and Technology at University of Toronto created an incredibly positive and collegial environment for me to work in. I’ve been lucky to grow and work alongside an astonishing group of scholars. Denise Horstley and Muna Salloum were more than administrative wonders: they were my cheerleaders. Marga Vicedo, Mark Solovey, and Paul Thompson offered advice for navigating the threshold of graduate school and frequently inquired about how my research was going. As my project heavily relied on archives in England, the department generously supported me through several travel grants. Lunchtime brownbag sessions provided me with opportunities to present my work in an informal setting; I am thankful for all of those who turned up for free sandwiches and/or pizza and took the time to think of thoughtful questions even when I didn’t make any sense. I am especially thankful to my fellow graduate students for our random conversations, though at time serving as a distraction, nevertheless helped me to tie together intellectual threads: Isaac Record, Ari Gross, Erich Weidenhammer, Aaron Wright, Cory Lewis, John Christopoulos, Paul Greenham, Chris Belanger, Kira Lussier, Anthony Kulic, Nico Salidas, and Jon Turner. Delia Gravus serves as an incredible inspiration as a writer and historian. She not only read key aspects of my work, but has cheered me on from afar. Charissa Varma delighted me with enlightening and entertaining chats. She also provided her hospitality during a visit to Cambridge and made sure I embraced the full glory of natural sciences with a tour through the Darwin Correspondence Project. Special thanks are owed to Mike Stuart, who sometimes took upon the dangerous task of untangling my web of thoughts. Our many conversations and paper exchanges helped to keep my head in order. Thank you for editing so much of my work and for believing in me—especially at times I found it impossible to continue forward. The CGS Doctoral Grant from the Social Sciences and Humanities Council of Canada gave me the financial flexibility to take long winters off and write in isolation. Travel grants from the School of Graduate Studies at University of Toronto provided immense support during long research trips. Chapter drafts were presented at various conferences and workshops. I’m grateful to audiences at these meeting and to the following societies for financial support that enabled me to participate: the Canadian Historical Association (2009), Society for the History of Technology (2009), the local organizing committee for the International Congress in History of Science and Technology (2009), the Canadian Society for History and Philosophy of Science (2012), the History of Science Society (2012), and the Disability History Association (2012). I’m also thankful for the University of Toronto for a fellowship while I was doing my masters studies and to the National Science Foundation for a grant in 2009 for additional support for the ICHST meeting. The final stages of completing my draft were undertaken in residence at the Max Planck Institute for the History of Science in Berlin on a pre-doctoral fellowship. I am tremendously grateful to Sabine Arnaud for initially inviting me to present at the Deaf World/Hearing World workshop and then offering me the fellowship. Our research interests overlapped at certain intersections and her invaluable insight has strengthened my analytical framework for chapter five. Special thanks are to fellow members of my research group: Raluca Enescu who kept me company during our occasional office hours and Debolina Dey for being a wonderful, curious, and creative person I am glad to count as a friend—we spent many hours together locked in our office, sitting in the courtyard, or making excursions to the market to delight in the variety of German cuisine. Mara Mills also arrived to MPIWG during my last month. I thank her for her patience for the many occasions I dropped by her office unannounced to share a new research find or ask yet another question, and for her friendly counsel in improving my research on hearing aids. The MPIWG library staff deserves all my praise for their tireless efforts to ensure any book I ordered was effectively delivered to my desk as soon as possible. As it can be daunting to reside in a foreign country, homesickness can be tended by the kindness of friends: special thanks to Bridgit Ramsingh for making sure my transition was an easy one, and to Anja Peters for welcoming me into her beautiful home and letting me fall in love with her family. This work owes so much to the generosity of librarians and archivists who tracked down records and manuscripts for me, especially through correspondence. These include: Philip Skroska at the Bernard Becker Medical Library; Jim Edmonson at the Dittrick Museum; Katherine Ott at Smithsonian; John W. Hawks at the Kenneth Berger Hearing Aid Museum; Wellcome Library and Archives; the Bodleian Library; the London Metropolitan Archives; Louise King at the Archives of the Royal College of Surgeons, England; the Science Museum Archives in London; the Royal Society of England; the Toynbee Collection at the Hunterian Museum; the British Library, especially for tracking down nearly-lost copies of The Aurist; Kate Collins at Duke University Special Collections; and Stephen Potter at Southwark Local Archives; the UK National Archives. Matt Edwards from the Gerstein Science Library at University of Toronto not only placed interlibrary orders from me, but kindly decided to deal with communication confusions by personally emailing me every time my materials arrived. I owe a tremendous debt of gratitude to Dom Stiles at the UCL Ear Institute and RNID Library. Dom not only dug up rare sources for me, but eagerly shared his own research with me. I enjoyed our countless of discussions over coffee, lunch breaks, dinners, and emails over the years. He has been my rock and I’m happy to count him as a friend. Of course, sometimes there are times that archival research encounters roadblocks. I’m thankful to John Hay and Peter Jackson for making inquiries on my behalf to access the archives at the Royal School for Deaf Children, Margate, even though at the end, I was denied access. I’m grateful for the incredible support from esteemed scholars who provided me with sage advice, read my work, and provided instrumental feedback: Graeme Gooday and Karen Sayer for sharing their research on hearing aids and for being wonderful friends; Christelle Rabier who cleaned up an untidy draft of chapter 4; Carl Benn for providing me with office space at Ryerson’s History department and encouraging me to finish chapter 2 while teaching; Bob Ruben for sharing his otolaryngology collection with me; Albert Murdy for clarifying medical terminologies; the anonymous referees and editors at Bulletin of the History of Medicine for their comments on chapter 4; John Hay for inviting me to publish an extract of chapter 1; Esme Cleall for helping me navigate into disability history; Jayne Elliot who edited an earlier draft of chapter 3; and Garland E. Allen who dispensed his wisdom on publishing. My dissertation grew up as the history of science landscape on twitter and the blogosphere was exploding. I’m grateful to Thony Christie, Greg Gbur and Michael Barton for introducing my blog posts on From the Hands of Quacks to other online scholars and helping me establish a virtual presence. This may be unconventional to traditional academia, but followers of my blog, including on twitter and facebook have continuously shared my love of history and motivated me to keep writing. Karen Bourrier invited me to participate in Nineteenth-Century Disability: Cultures & Contexts, encouraging me to branch out of my comfort zone and explore the material culture of hearing aids. Lindsey Fitzharris-Bracken also provided inspiration for navigating between digital humanities and public history. We bonded over our love for syphilis stories, quirky histories of medicine, and bottles of shiraz. David Pantalony deserves his own paragraph. I have been blessed in having him as a mentor. He tirelessly kept me on track with my research, sending emails asking for updates, and guiding me with difficult moments of analysis. He read incoherent drafts of chapters, highlighting the strengths and forcing me to transform the weaknesses into strengths. A trip to Ottawa for the Reading Artifacts Seminar introduced me to different elements of material culture research, but David further took me backstage to allow me to see how my artistic eye can introduce new dimensions for artefact analysis. It goes without saying that so much of David is in reflected in my growth as a scholar and in future directions of my research; he was the first person I emailed when stuck on a research problem and frequently served as a tremendous source of strength. I am eternally grateful for how he put me in touch with scholars whose influence I could benefit from, how he sent me applications for fellowships, and how he unfailingly provided me with moral support and encouragement. His enthusiasm and insight made me determined me to finish this project. I owe so much to him. Finally, I thank those I consider my family, who frequently dealt with my prolonged absences and crankiness through many long periods of writing. Teresa Branch-Smith, Colleen Burns, Menolly Lysne, and Sarah Kay dealt with cancelled plans and neglected phone calls, but never let me forget the importance of glamour. Zoona Khalid provided years of moral support and joined me on several research trips, reminding me to have fun and leave work behind once in a while. Lucy and Gizmo kept me company during many cold winter days, showering me with unconditional love and reminding me that even bad days can end up good. My in-laws purchased a beautiful desk for me, making me feel so welcome into their family. My mother has been a constant source of inspiration, strength, and devotion. I am especially grateful to my siblings for being a source of love, encouragement, and support, especially during trying times. My brother Jaskaran teased me for reading too much, but that didn’t stop him from helping me organize my files before I started on this huge project. My sister Pooja was a frequent source of comedic relief. More than that, she helped me study my French, accompanied me on research trips, and every once in a while, asked me how “Curtis that aurist you never shut up about” was doing. When we were growing up, my sister Sundeep and I spent so many sleepless nights discussing philosophy and history. Nothing really changed, though she deserves her thanks for helping me frame the narrative thrust of my dissertation while she was finishing her own Masters thesis. She is courageous and wonderful and I am so grateful for her support. And to Harry: there were so many moments you couldn’t understand what I was doing, or even why I was doing it. I love you in ways I could never adequately express through words. You quietly accompanied me on this journey and had the difficult task of dealing with my mood swings, my constant travels, and moments of sleep-deprived insanity.Thank you for always making sure I never fly too close to the sun. My heartiest congratulations to you in obtaining your doctorate, Dr Jai Virdi! Wow, you mentioned me….. congratulation, Jai!